The C.I.A.’s first overseas detention site was in Thailand. It was run by Ms. Haspel, who oversaw the brutal interrogations of two detainees, Abu Zubaydah and Abd al-Rahim al-Nashiri. Mr. Zubaydah alone was waterboarded 83 times in a single month, had his head repeatedly slammed into walls and endured other harsh methods before interrogators decided he had no useful information to provide. The sessions were videotaped and the recordings stored in a safe at the C.I.A. station in Thailand until 2005, when they were ordered destroyed. By then, Ms. Haspel was serving at C.I.A. headquarters, and it was her name that was on the cable carrying the destruction orders. The agency maintains that the decision to destroy the recordings was made by Ms. Haspel’s boss at the time, Jose Rodriguez, who was the head of the C.I.A.’s clandestine service. Like many Americans, I understand the urgency that drove the decision to resort to so-called enhanced interrogation methods after our country was attacked. I know that those who used enhanced interrogation methods and those who approved them wanted to protect Americans from harm. I appreciate their dilemma and the strain of their duty. But as I have argued many times, the methods we employ to keep our nation safe must be as right and just as the values we aspire to live up to and promote in the world. I believe Gina Haspel is a patriot who loves our country and has devoted her professional life to its service and defense. However, Ms. Haspel’s role in overseeing the use of torture by Americans is disturbing. Her refusal to acknowledge torture’s immorality is disqualifying. I believe the Senate should exercise its duty of advice and consent and reject this nomination. Now compare that to the statement just released by the Democratic Senator from Virginia. I acknowledge that this has been a difficult decision. There are valid questions that have been raised regarding the Acting Director’s record, and I have been frank with Ms. Haspel that I wish she had been more open with the American public during this process. 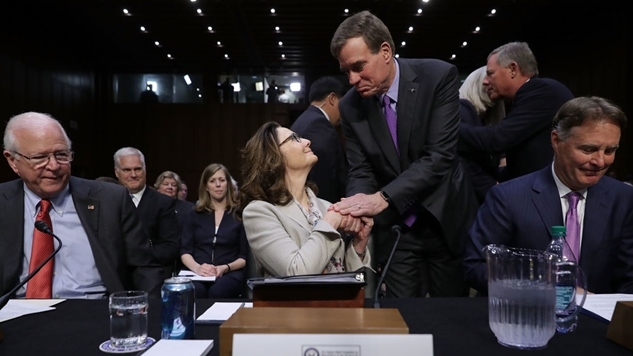 However, in both our one-on-one meetings and in classified session before the Committee, I found Acting Director Haspel to be more forthcoming regarding her views on the interrogation program, which is why I asked her to memorialize those comments in writing. I also take to heart the strong support Ms. Haspel has among rank-and-file members of the intelligence community and from intelligence community leaders who served under President Obama. I’m going to support Gina Haspel’s nomination to be Director of the CIA. I also respect my colleagues who have made a different decision. Let’s remove party affiliations altogether and just look at McCain and Warner’s statements through learned experiences. One spent over five years being tortured nonstop at the Hanoi Hilton, while the other didn’t. The one who endured torture said that Haspel’s public defense of torture is disqualifying, while the one who didn’t get tortured said what Haspel told him behind closed doors is good enough for him to ignore her public statements. This country will never have its much-needed reckoning on our history of torture until we can either replace or surround “Democrats” like Mark Warner (who also helped to reverse President Obama’s Dodd-Frank rules on banks) with people who truly understand the depravity of torture without having to endure it like John McCain. Shame on Mark Warner.